If you’re basing your trading strategies on trend-line analysis, you need to be aware that price levels derived from trend lines will change depending on the slope of the trend line. The slope of a trend line refers to the angle of a trend line relative to a horizontal line. The steeper the slope of the trend line, the more the relevant price level will change over time; the shallower the slope, the more gradually the price levels will change with time. The figure gives you a good idea of how short-term price levels based on a 15-minute trend line will shift over the course of just a few hours. Note how steeply the trend line is sloping upward. For prices to continue to move higher in line with this trend line, they must stay above the trend line as it rises over time, suggesting price gains of 10 to 15 pips per hour are needed. Using your charting system, you can pinpoint relatively accurately where prices must be in the future for the trend line to remain active as a support/resistance level. To do this, slide the cursor along the trend line, and note the time that appears on the horizontal axis at the bottom of the chart. The same applies with longer-term charts, but the price shifts are typically less pronounced, meaning an hourly trend line may see levels adjust by 10 to 15 pips every 6 to 12 hours, and daily charts may see levels shift by 10 to 30 pips over a few days. But there are no concrete rules on this; it all depends on the slope of the trend line. Short-term and overnight positions: Consider where trend-line support or resistance will be over the next 6 to 12 hours, when your position is still active but you may not be able to actively follow the market. 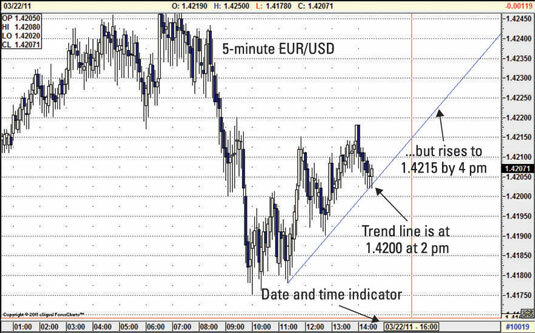 You may want to use a trailing stop as a proxy for changes in trend-line-based support/resistance levels. Limit-entry orders: If your limit buying/selling order is based on a sloping trend line, periodically adjust your order so that it’s still in play according to changes in the trend line. You may miss a trade entry if the trend line is eventually touched, but, in the meantime, its level has shifted away from where you first placed the order. Breakouts: A significant trend line that looks to be a mile away one week may suddenly be within striking distance in the following week or two weeks, substantially altering the market’s outlook. Alternatively, the market may be focused on a price high/low as a breakout trigger, when a sloping trend line touching that high/low may actually be the catalyst for a breakout.